This is the right time to buy 360° camera because present era is stepping ahead to a new world of adventures where spherical videos are given more preferences. So many gadgets have been developed to assist users of Virtual Reality world that is created with the help of 360° videos; whether you are new to spherical videos or are a professional videographer, in both cases following details will be helpful for you. Here we have provided a trustworthy review for Bublcam 360 so that users can make an easy decision about whether to buy it or not. Bubl has recently designed its most wonderful product with 360° spherical video capturing abilities and VR imaging needs. It is available in two different modes that are multiplex and equirectangular but the devices come with incredible features that will give a new direction to your Virtual Reality world. The camera unit is designed to give new meaning to selfie and here resulting 360 videos are always blindspot less along with amazing HD photograph quality. It consists of four high quality lenses that have real time stitching facility adding more convenience in usage. The most commonly used Bublcam unit is designed with easy to use features where limited control buttons are available at panel; these buttons are image/video mode, power control. Other than this all major controls can be done via applications that are installed on iOS and Android devices. If we talk about the physical size of the tiny camera unit then it will appear like a baseball sized attractive sphere that provides abilities to use it as like an action cam. The lens mounts as well as shell are created with high quality plastic material whereas the rings of lens are designed of die cast aluminum that are reinforced with special rubber rings for additional reliability and stability. It is possible to connect the Bublcam camera unit to Android or iOS devices using specially designed application- BubleXplor. With the help of this BublXplo app you will need to search your camera unit via phone using Wi-Fi connectivity and after making connection like a standard hotspot, you will be able to control the 360° camera from distance mode. On the other side, this camera can also be controlled with the help of Bubl Power Button option where you can capture photos as well as videos with just a single tap. Bublecam 360° camera unit is designed to assists users in sports activities, for travelling needs as well as for home surveillance type applications. It is a durable and reliable unit for action camera users where image quality is really wonderful so that you can capture all beautiful memories at special events organized with friends and family members. Image: The complete package of Bublcam use to consist of 4 different cameras having 5 megapixel capacities where each one of these possess 1.2 mm lens. All these cameras work together to capture a complete 360 degree view with 14 megapixel clarity and the results are fully spherical. That means you will never find any missing areas or blind spots in the captured scene. 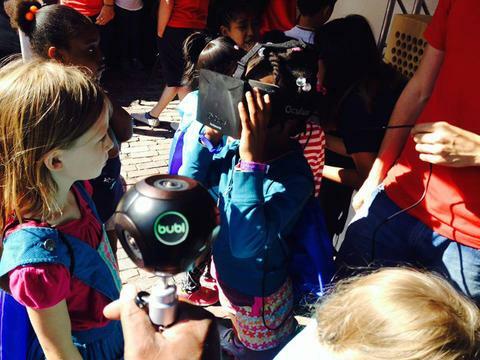 Video: The Bublcam being a 360 degree camera unit has power to capture whole world surrounding us in a single shot. There are two different output sizes for videos captured by Bublcam spherical camera i.e. 1080p at 30fps, 1440 at 15fps. Although none of these will give you full HD experience, size ranges of captured videos are nominal that can be stored easily and images can also be stretched out up to 4 times spaces. If you set your video mode to 1440p video setting then it will lead to decent clarity and wonderful image brightness. The most amazing thing to know about Bublcam 360 is that captured photographs are automatically stitched inside so that users need not to spend additional time for this task. To capture your photographs you simply need to adjust settings and then press shutter, rest all is managed by the cam itself. In order to share your captured memories on other devices you are free to use Wi-Fi connectivity as well as USB port. This latest 360° video recording device is available with lots of amazing features but the video quality is an issue. Those who are searching for a spherical camera to capture 360° images can buy this Bublcam; it will definitely make your memories more awesome. As per reviews, Bublcam is considered to be the most suitable solution with affordable price range and this all in one camera unit allows easy storage on SD cards. How is this being reviewed in November 2017, when Bublcam hasn't fulfilled any orders from as far back as December 2015? I ordered my bubl cam since May 2016 and never received the products, Last month I decided to cancel and not received full refund too after waiting for a month.